Start optimizing your company referral program, download our free eBook today! 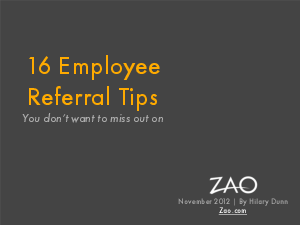 Zao passionately believes that your professional and personal networks can yield referrals just as well as your employees. We also think that in a world where our contacts (and most of their resumes) are mapped out on social networks, it doesn't make sense to sift through them manually. Make it easy for referrers to recommend friends by matching your job description to the capabilities of their friends.